Tipperary were a level or two above Offaly in a game in which the faithful county battled hard, but could not match the power of their opponents. Joe Coleman and Jerry O’Neill in the Wexford forward line provided a mountain that Offaly could not overcome. Russell Quirke looks for assistance. Joe Coleman at center forward was the powerhouse for Tipperary in the first half. The St. Martin’s man was involved with almost everything happening for Tipperary. Whether it was the free taking, one early score came from well inside his own half of the field, or from play, the Wexfordman was hard to stop. John Kindregan also did well at wing back for Tipp, the veteran intervened to put a stop to ball played into to Offaly forward line. 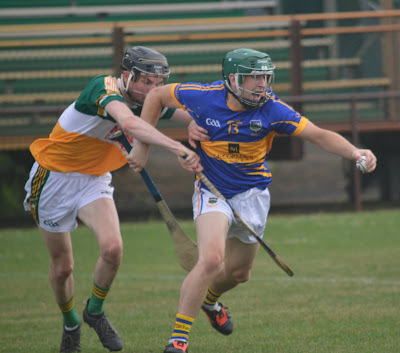 Tipp netted three times in the opening half, Jerry O’Neill at corner forward was dangerous and claimed two of the goals, Russell Quirke in the opposite corner the third. Offaly kept at it however, and converted points from Niall Mannion frees, while Jack Dunphy and Emmet Moran battled hard in the back line. Tipp were too strong however, and at the half it was Tipp holding the aces at a score of 3-11 to 0-5. Harry O'Connor on the ball. Early in the second half the Tipp men bagged another goal, this one from Dylan Hyland who had entered play as a sub. The teams traded scores, however another goal came for Tipperary as they underlined their superiority. Each side gave the subs a run early as the outcome was beyond doubt. Offaly brought some respectability to the scoreboard with some converted frees. Tipperary looking like a class above in their first 2 outings, but are sure to have a tougher time of it when they meet Galway next week. 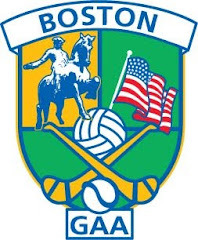 Tipp: Evan Condon, Darragh Fanning, Sean McGarr, Paul Morris, Kieran Bennett, John Kindregan, Simon Kennedy, Cronan Dempsey, Joe O’Connor, Joe Coleman, Harry O’Connor, Jerry O’Neill, Russell Quirke. Offaly: Gary Sherlock, Emmet Moran, Jack Dunphy, Jack Murray, Oisin McCormack, Conor Grimes, Donal O’Dwyer, Robert Croft, Brian Ramsey, Cillian Campbell, Chris McMahon, Niall Mannion, Stephen Brown.